As an SCA scribe, I'm both scroll designer and producer. Without a knack for each and both together the scrolls I do fall short. Luminous scribal creations are best handled by frequent practice, exploration, and experiment. Each scroll is unique for the accumulated knowledge and skills expressed at the time you produce it. Your entire scribal experiences flow into each work you make. Whether calligraphy or illumination, each combines multiple strokes into steps formed into parts connecting to make the whole scroll. The creative process. You can enhance your work by nurturing your visual awareness. Increase your observation powers through constant practice and make them part of you. Be committed to continually looking at medieval manuscripts. More than that, look at every detail. Every descender's swoop and paint stroke layer. Every design element and calligraphed line. Look and compare them in your mind's eye to other similar or different manuscripts. In the past, I did this with monthly trips to the University Library, carting home tomes of manuscript facsimiles and other books. I'd sit in my recliner, sometimes with a magnifying glass, and look at every pen and brush stroke. Now you can do this online without leaving home, and save your favorite, beautiful or weirdest images. I recommend searching for manuscript images, perusing them in detail as I did with a magnifying glass, but saving them to Pinterest. I have multiple Pinterest "board" collections. These compilations range from the ridiculous to the sublime, the tacky to the curious. Saving images to Pinterest automatically records the location, providing future access. And I can review, share and update the boards later. Studying the works I found and noting what I saw on Pinterest helps me to learn what I liked about some works and didn't like about others. My collections have both good and bad examples, exquisite manuscripts and commonplace books. They are an information treasury to improve my visual awareness and enlarge my inspiration sources. I don't always seek out whole manuscripts, or even whole pages. Looking at page parts is a powerful tool. I'm able to zero in on a single scribal aspect, such as acanthus leaves in multiple manuscripts or many books with a similar script. You can discover exciting, interesting relationships between shapes, colors, lettering, and ornament by this. And it's your personal discovery, not a museum manuscript curator's. However you do it, these inquiries are vital to your scribal experience. It is inspiration gathering, even though you may not have a scroll assignment at the time. Looking at medieval scribal works broad legacy is a decisive part of your creative development. Cyber-Monday is tomorrow, so I hope you see this in time. There's also little for scribal illuminators at local bookstores. And nothing on history, gouache application, or medieval manuscript terminology. So shopping for these items Monday online is perfect timing. The Art of Calligraphy: A Practical Guide To The Skills And Techniques, by David Harris, Dorling Kindersley, New York, 1995. Creative Calligraphy: A Complete Course by Marie Lynskey, Thorsons Publishers Ltd., England, 1988. A History of Illuminated Manuscripts, by Christopher De Hamel, Phaidon Press, 1997. The Illuminated Alphabet, by Patricia Seligman and Timothy Noad, Running Press, London, 1994. Illumination for Calligraphers: The complete guide for the ambitious calligrapher, by Marie Lynskey, Thorsons, London, 1990. Medieval Calligraphy It's History and Technique, by Marc Drogin, Dover Publications, New York, 1989. Medieval Illuminators and Their Methods of Work, by Jonathan J.G. Alexander. Yale University Press, New Haven and London, 1992. 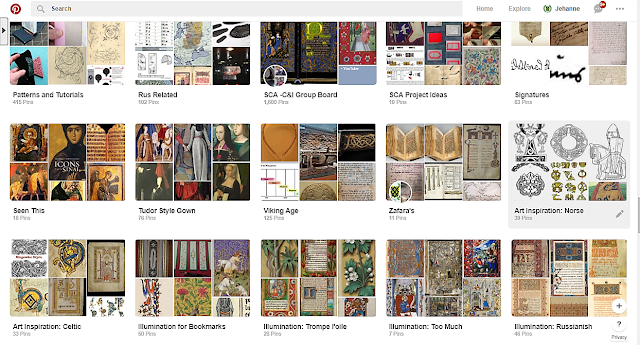 Understanding Illuminated Manuscripts, A Guide To Technical Terms, by Michelle P. Brown. The J. Paul Getty Museum in association with The British Library, 1994. Tomorrow is Thanksgiving Day. A time my family and I give thanks for our blessings and enjoy great food. Especially food grown and harvested ourselves. While I didn't grow anything edible several in the family did. Tomatoes and pumpkins for sure. I'm thankful to celebrate and share their family harvest festival. I'm also thankful for fests I share with my friends in the Barony of the Lonely Tower. Taking time to give thanks and celebrate the harvest goes back before Europeans came to the shores of the United States. Native Americans have shown gratitude, given and shared their harvest since time immemorial. In grade-school I learned the Pilgrims celebrated the first Thanksgiving. Today it's known the first documented Thanksgivings in the future United States were held by the Spaniards and the French in the 16th century. By 1607 Thanksgiving services were routine in the future Commonwealth of Virginia. And the first permanent Jamestown, Virginia settlement held a thanksgiving in 1610. People feasting and being served in the 14th century Luttrell Psalter bas-de-page detail scene. Feasting and Thanksgiving have changed over the centuries. Our family gathering tomorrow will have more than enough food for us all. But it won't be my Grandmother's formal Thanksgiving. Ours is a very blended family and our menu will reflect that. There will be turkey, deserts and celebration beverages. There will also be many guest provided dishes and treats. In today's world Thanksgiving sharing is what our family does. We share the food, we share the cooking and we share the related work. I hope tomorrow you are as blessed with sharing. Recently I was asked to create text for an award scroll. It's something I like doing and use to do often. The common awards are based on period charters and patents of arms. The period inspirations are not actual awards but often legal documents giving land or other rights. They sound very lawyerly because they were legal documents then. Some text writers, like Calontir's Masters Dolan Madoc and Rhodri ap Hywel, become experts at composing period-style poetic text. Even with poems, the writer must find a way to include the above items or the award isn't properly noted. 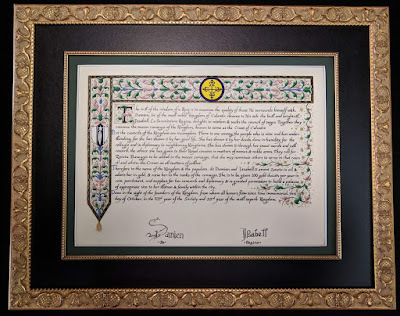 What the SCA calls a scroll serves as proof to other people and Kingdoms the recipient received the stated award, when, where and by whom it was given. There are many ways SCA awards are different from period documents. Period documents of all sorts mention God and do it often. Dates were often given in reference to the most recent or next religious happening, especially the more important the document. Grants of land were given when honors were bestowed. Queens were seldom mentioned unless the lands were hers. Honors were not often given for arts and sciences. Writings commonly begin with a greeting, state from whom they come and may include descriptive bragging. Writings were wordy, repetitious and used long, unusual sounding words. When researching period sources Google search is your BFF. General terms I've searched include medieval charter, medieval grant, medieval letters patent, and medieval legal document. Other similar options might be medieval literature, medieval texts, and medieval writing. 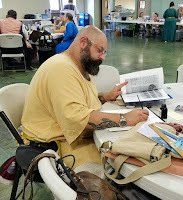 Colyne Stewart (mka Todd Fischer) of the Scriptorium blog provides excellent information on it and the class he gave at Knowne World Heraldic and Scribal Symposium, June 2015. You can read his handout pdf paper here. For me the fun of writing award texts is arranging selected, relevant snippets from period sources into appropriate persona related award text with a flow and feel of the era. Scouting out and reading original sources I get a feel for the style and phrasing the medieval author used. I like how I feel connecting through words to the Middle Ages. 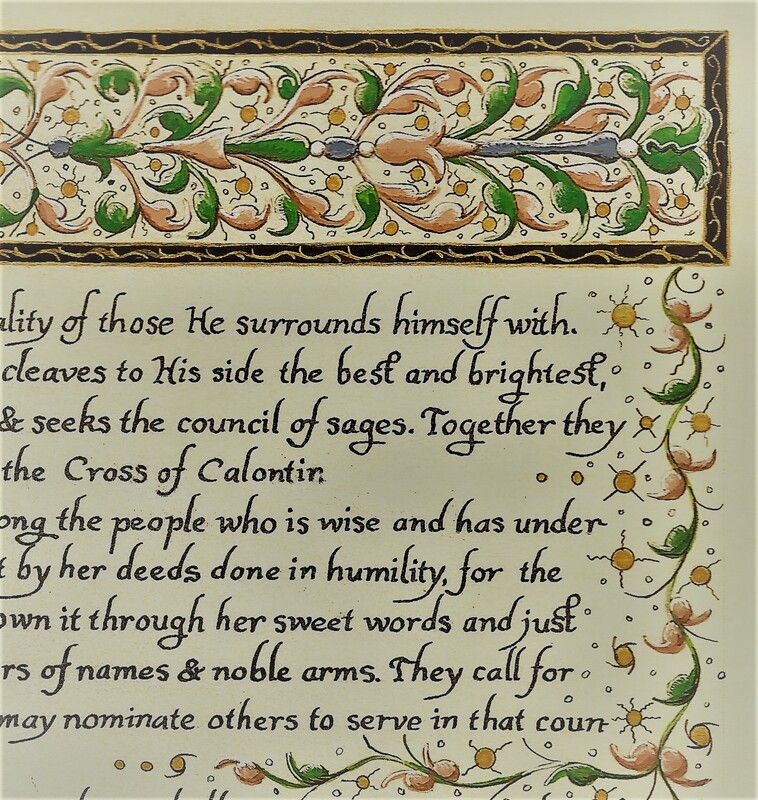 The Scriptorium: A collection of resources and examples of writing for SCA award scrolls. Particularly note the Resources and Articles sections. I read recently that learning calligraphy refines one’s temperament. Well, mine certainly needs refining. But why should you learn calligraphy besides you feel it in your "bones" you want to do it? These are a few reasons I have. Calligraphy is not expensive to learn. It's a silly reason if it's your only one. It's an important factor if you already are artsy. You can get basic supplies for less than $20. I don't recommend commercial kits; you can gather your own higher quality materials for about the same price. As with many scribes, I started calligraphy using a Manuscript cartridge pen. You can buy this set for under $10 from Walmart or Michaels. I use a smooth paper for practice like for laser printers. Regular printer paper causes the ink to bleed. With laser paper, you can also print your own practice guidelines or layout grid. The possibilities to explore with calligraphy are endless. After learning the basics I enjoyed experimenting. I learned different script styles so I could fit the script to the recipent's SCA persona. I explored dip pens and nibs, historic inks and different supports. There's even more variety of play if you don't stick within the SCA period. Anyone interested can do calligraphy. Baring physical handicaps, calligraphy can be done by anyone enthused about it. I like it because it's good for the brain. Learning excites the synapses. My grandkids are lucky they're in a school that still teaches writing. They'll grow into adults that can visualize unique letters shapes while others only talk to a computer. Calligraphy develops my detail observance. The lettering pen stroke, ink flow, and thick-to-thin change draw out my minute attention. This helps my illumination too. I have instant gratification by making things with my hands. It's even relaxing. Lettering a few words takes little time and it's even improved my cursive. I have to practice to get stunning letters but that happens sooner than you think. The next script I try will be even easier to learn. And more fun. My calligraphy before I painted Zaneta's Cross scroll. 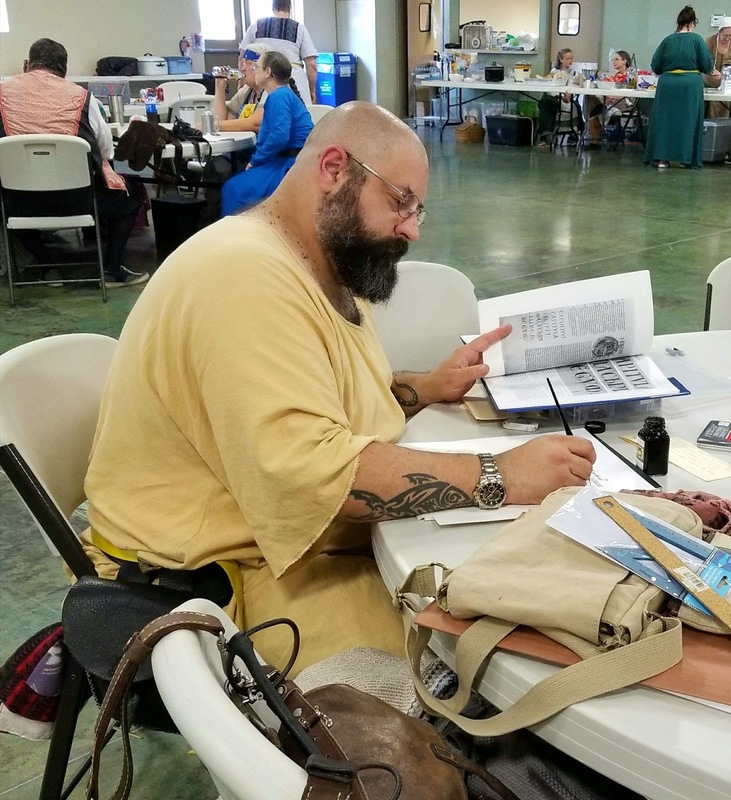 In the SCA the biggest reason to learn calligraphy is independence. Often there isn't much time to complete a scroll before its planned presentation date. When I do both the lettering and the illumination I have more time to work on that scroll. I'm also in charge of the awards final appearance. I'm sure I've missed some reasons to learn calligraphy. And, they may be different for modern calligraphers. These are the reasons that come from my life and the SCA. How to Select a Calligraphy Guide Book?. This is unique and special. 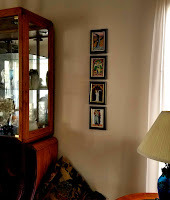 Amy Dreyer, known as Lady Beatrix in Calontir, posted a picture of HL Zaneta Baseggio's Calon Cross scroll after she framed it. I never get to see a scroll's end result. This is fabulous. 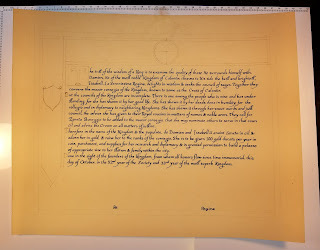 When I create a scroll, if possible, I want it to fit a standard size frame so the recipient can save money to display it. Amy went extra miles to custom frame Zaneta's award. The frame itself appears to be a Renaissance-era repeating pattern of gold acanthus leaves. It echoes the border I emulated on the award. She also included a double mat. 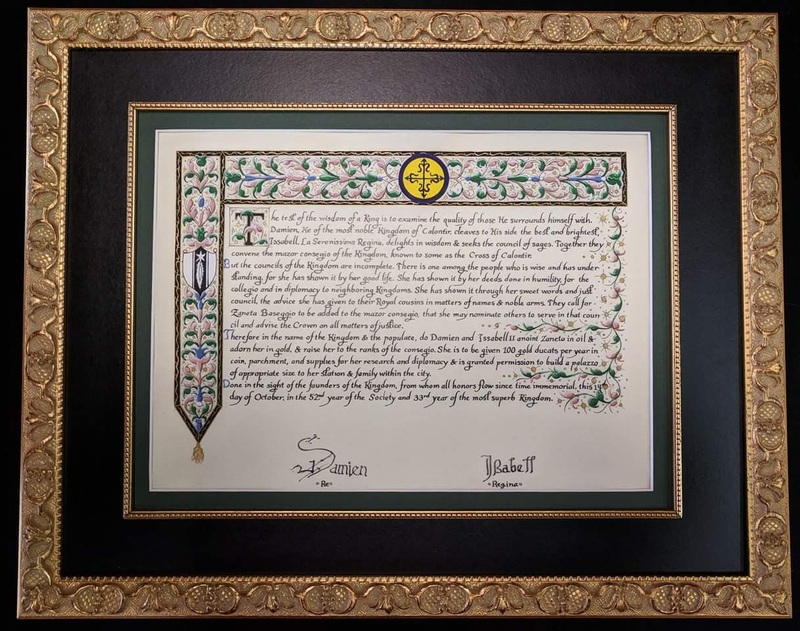 Amy's thoughtful choices made Zaneta's scroll into a truly prized work. Thank you. I've mentioned lettering a scroll using a lightpad and a text mock-up to assist with line spacing for my calligraphy. This keeps me from omitting letters or words, wasting time restarting or using more of my limited pergamenata resources. Sometimes I use a preprinted grid in the same way. Both preprinted methods save time. But what do you do if you can't use a light-box or a preprint? How do you draw even parallel guidelines? Before I answer those questions, it helps to know basic terms for letter parts and line spacing. Letter heights are the measurement from the bottom edge of a small letter “o” to its top. This letter area is called the "body" or "minum". 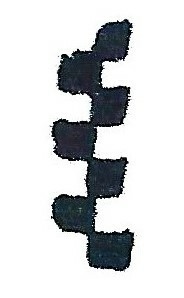 A letter part hanging below the minum, such as a "p" or "q" tail, is called a "descender". Any part rising above the letter's "body", such as the upper part of a "b" or "d", is called an "ascender”. Enlarged calligraphy labeled with letter and spacing terms. Calligraphers measure a letter's body height in a nib stroke ladder-like series called the "x-height". The x-height is measured by a scale of nib strokes placed horizontally, one over the other. Knowing the size letter-body or x-height a pen nib makes helps you select the nib to suit the space a letter's body will fill. Conversely, if you want to use a specific nib, you determine the distance between the top and bottom of a letter's body by making five stacked nib strokes. Then measure that distance for the guidelines it will need. Different sized nibs lead to different x-heights. Generally, differently spaced guidelines for a letter's body may require a different size nib. When lining a page you will want to have another lined space above and below the area for the letters' bodies. This area is for letters with ascenders, descenders, or any capital/majuscule letters. It is called the "interlinear space". It is generally about twice an x-height, but that depends on the script you use. Before drawing a scroll's guidelines I have to know how far apart the lines need to be. That's where the x-height and interlinear space determinations come in. You need those distances to plan your spacing. Generally, you will rule up your page with lines alternating with 1 x-height separated by a 2 x-height space. I could fill a whole page with these lines for my favorite scripts to use with my lightpad. The same way I used my preprinted grids and text mock-ups. Most original SCA scrolls are wordy causing scribes to make very small letters. Take time making x-height test nib strokes for those. Maybe do them a few times. When making nib ladders, be sure that the marks only touch and don't overlap each other. Overlapping any strokes, like I did in the top of the ladder scanned here, causes inaccurate x-height measures. Those measures are more important the narrower the nib's edge. evenly measure and mark tiny dots down each side of the page and draw lines between the dots horizontally across the page. measure dots down one side of a page, then use a t-square and a perfectly square board to draw lines from each dot out to the opposite side. Measuring and marking tiny dots down a page evenly is tedious and time-consuming. --The biggest reason I love my lightpad.-- To appear neat I also want the guideline spacing to be consistent. To make repeating tick-marks I find it easier and faster to first use a ruler and pencil to measure the distance and tick-mark four line sets down a scrap paper's edge. Next, I place the scrap paper where I want to start my lines and mark ticks on my support. For more lines, I just line up the top scrap paper mark with the bottom tick I just made and continue down my page. I repeat as necessary. To do the opposite side of my support, I carefully measure the first tick-mark's distance from the top edge of my perfectly squared pergamenata. Then accurately measure the same distance down the opposite edge and make a pencil mark. I then line the top scrap paper mark with my carefully measured mark. I proceed down the opposite edge as I did before. After the page is accurately measured, the easy part is drawing the guidelines between the tick-marks on the page's edges. So my guidelines are accurate, I use a sharp H or 2H pencil. But I have a heavy hand. If you press lightly you may like a softer pencil. A harder pencil produces a finer line for a longer time before it needs sharpening. Either way, you want to work with a sharp point. To have a constant point some scribes prefer a mechanical pencil. There are many scribes that rule up their page with a pencil and a ruler. I'm cautious when I use this method, as I may get lines that aren't square or parallel to each other. Sometimes I'll miss a tick and have my lines all a kilter. They're also difficult and time-consuming to consistently make. Even so, it's important to know this method to use like another "tool" in your scribal skills tool box. Using a t-square is a later post planned for this series. 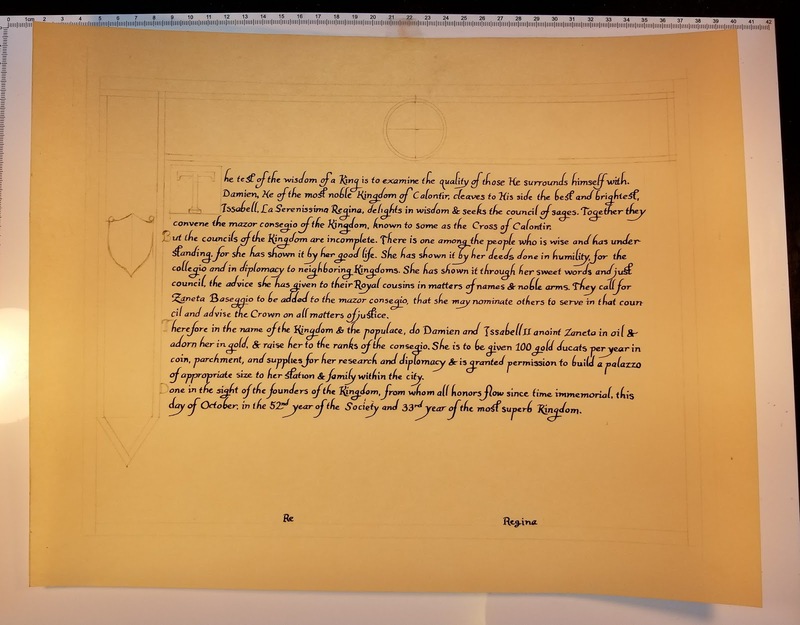 The Making Of An SCA Scroll, Part 1. I have a new favorite gold paint. It is Finetec's Artist Mica Opaque Watercolor. It's as good as the Perl Ex mica paint I used previously plus I don't have to mix it with a gum Arabic binder. It comes in small hard paint pans. So easy to use, it flows onto the support just like I use gouache. The results are as beautiful as the artist can make. I've used it directly on natural pergamenata and over black gouache underpainting. It handles well in fine lines and larger blobs. You can see for yourself in my scanned image. This gold product was one of six refills, all the same color, I bought on Amazon for about $10.00. I accidentally ran into the listing when I was looking for something else. Although I'd heard great things about this product from other scribes I didn't know how fast I'd use it up. I thought the multiple pans would solve that problem. 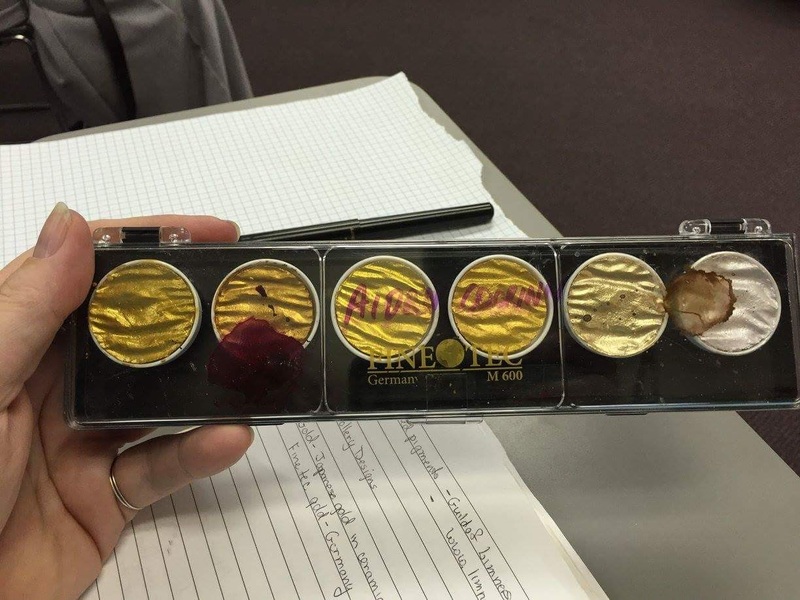 This gold covers as much area as any gouache, so the six pans were more than enough. I've given a few away to friends as gifts. While I only bought one color you can buy this product in a six-color set: Tibet Gold, Inca Gold, Arabic Gold, Gold Pearl, Moon Gold and Sterling Silver. The price varies dramatically, so check multiple sources. While this is my new favorite gold paint, it isn't perfect. It takes a healthy amount to appear gold. In a wash, it only gives a gold sheen to the surface. It wouldn't work thinned for a dip pen and may need several coats for large areas. For convenience, price, and quality this Finetec gold is my new best gold scroll paint. This gold paint will be hard to beat. Our gift-giving season is fast approaching. It's a busy time of the year for everyone. Often I've created gifts with calligraphy and illumination, especially 12th Night gifts. A decorated personal thank you note to a special person. Depending on your the luck of your draw, you might create a Nobelesse Largesse swap item. If you are a bookbinder or know one, you could decorate book ends. Handmade bookplates make great small gifts or auction items. Certificates for graduations, weddings, ketuba, and births. Greeting or gift cards that are blank inside. 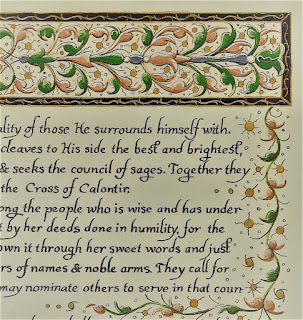 There are many ways to use calligraphy and illumination within and outside the SCA. 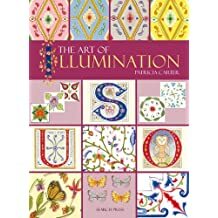 Patricia Carter in her book The Art of Illumination gives instructions for making her modern versions. You may find similar items for sale in Etsy shops. I've framed pictures from my Championship entry displayed on my living room wall. You might also make scanned and printed copies of your art to snail-mail friends for a gift-giving holiday. Those are my gift-giving holiday ideas. Hope one or some work for you. If not this year maybe next.